﻿ How to Fix Audio Video Out of Sync Converting from WTV, MKV, AVI, etc with Bigasoft Converter? Home » video » How to Synchronize Audio and Video after Conversion? How to Fix Audio Video Out of Sync Issue after Conversion, Trimming and Merging? It will be very much annoying if the audio/sound/music is behind or ahead of a video/image/graphic, even if it is only for two or one second. If you are encountering audio video sync issue (also called the lip sync error) when trying to convert your video either in WTV, MKV, AVI, MOV, WMV, WebM, HD, AVCHD MTS, etc using Bigasoft converter or converters from other brand, you can follow the tips to fix the audio video out of sync issue. Source video files with audio and video are correctly synced but out of sync after conversion. The resolution will not work if the audio and video of your source files do not match. Audio lags behind of video when using the trim, merge features of Bigasoft Converter or converters from other brand. Audio and video do not match after conversion using converters of other brand like the free VLC, MPEG Steam. 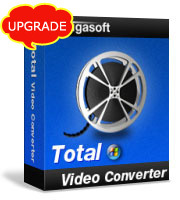 All Bigasoft Converters like Total Video Converter, WTV Converter, iMovie Converter, iPad Video Converter, iPod Video Converter, WMV Converter, AVI Converter, MP4 Converter, etc. 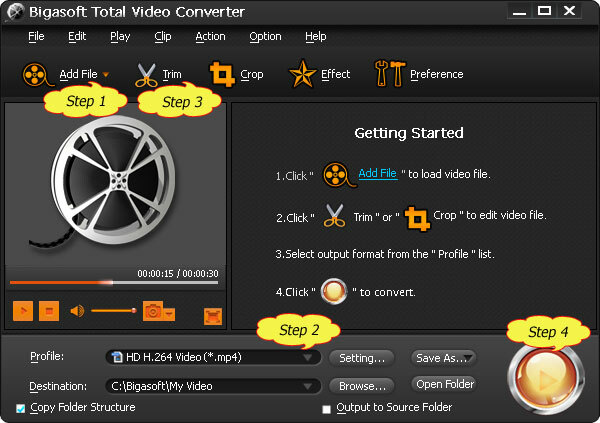 Bigasoft Total Video Converter (Windows Version, Mac Version), install and run it. This step is optional. If you already downloaded a converter from Bigasoft, you do not need to download it again. If you use Bigasoft converter with version earlier than 3.6.19.4501, you will need to free update to latest version from Bigasoft Download Center. Bigasoft Total Video Converter provides professional solutions for various video conversion, audio conversion and video to audio conversion, as well as advanced features like trim, crop, merge, deinterlace and split videos and more. In addition, Bigasoft Total Video Converter can be used to fix audio and video out of sync after conversion from MKV, MTS, WTV, WMV, WebM, FLV, AVI, MP4, VOB and any other video formats to MP4, AVI, WMV, etc. Click "Add File" to add your source files or simply drag and drop the files to Bigasoft Converter. For example, if you want to convert WTV to H.264 MP4 format, please choose the profile as " H.264/MPEG-4 AVC Video (*.mp4)" from the "Profile" Drop-down list. Press Trim button to trim wanted video clip by setting the start time and end time. Press Crop button to crop unwanted video part. Press Effect button to customize video like adding watermark, subtitle, audio track, artistic effects. Click Setting button to set output video size, video quality, audio quality, adjust audio volume, and choose audio channel and more. Click "Settings..." right beside Profile list to open the "Advanced Setting" Window. Go to "Advanced" tab. You will see two categories including "Video" and "Audio". In the "Video" category, click "+" to expand the "Video" items. Find "async" and set the value as "1". Click "Apply to All" to save the setting. In the "Advanced Setting" Window, you can also set output video size, video and video quality, adjust audio volume, and choose audio channel and more. You can save the customized profile for later use by clicking on "Save As..." and name the profile. Click the big blue convert button at the bottom of the software interface to start convert. After setting the av sync value to "1" in the "Advanced Setting" window in Bigasoft Converter, you will find trimming, merging and converting your video files to any desired video format will be perfectly in sync of audio and video. It's just that easy.